Title: Dynamical Evolution of the Earth-Moon Progenitors – Whence Theia? First Author Institution: Space Science and Astrobiology Division MS 245-3, NASA Ames Research Center, Moffett Field, CA 94035, U.S.A. 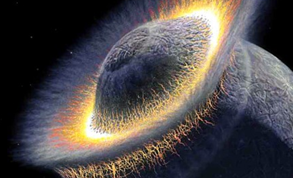 Figure 1: Artist’s impression of the Giant Impact Hypothesis of the formation of the Moon. The mystery of the formation of the Earth’s Moon was one that plagued astronomers for centuries. Many theories were proposed, including the fission of the Moon from the Earth’s crust, gravitational capture of the Moon and co-formation of the Earth and the Moon at the same time from the debris disk of material around the Sun. However neither of these theories successfully explained many of the oddities we observe in the Earth-Moon system; the lack of iron on the Moon compared to the iron rich Earth, the high-angular momentum of the system and the similar material composition of the two bodies, which are massively different from any other rocky Solar System body. The Giant Impact Hypothesis says that the Moon was formed from the debris of a glancing collision between Earth and another rocky body roughly the size of Mars (1/2 the diameter of the Earth) named Theia (after the mythological Greek goddess who was the mother of the goddess of the Moon). It was proposed in the mid 20th century but was dismissed as an unlikely scenario until the 1980s when it emerged as the leading theory because it could better explain observations. The lack of iron in the Moon is caused by the impact, which immediately turns both colliding bodies molten – since iron is the heaviest element it sinks to the core of the Earth, leaving the Moon to form from the anaemic debris thrown off by both planets. This also explains why the Earth and Moon are so similar in composition, as the material from the Earth and Theia was so thoroughly mixed in the impact. The high angular momentum is also a relic of the large amount of energy input into the system by the impact. As technology has progressed, simulations have shown that an impact at a glancing angle of 30 – 40° would result in an Earth-Moon system like we see today. But arriving at a scenario where Theia can impact upon the Earth at this very specific angle range in the turbulent early Solar System requires a very specific set of initial configurations of the Solar System. 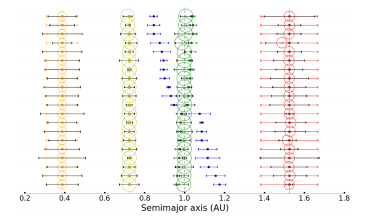 The authors of this paper try to determine what the possible configurations of orbital parameters of the 5 inner rocky planets (Mercury, Venus, Theia, Earth and Mars) could have been in order to provide the Goldilocks scenario for the formation of the Moon. That the sum of the masses of proto-Earth and Theia equals the sum of the current Earth-Moon system. That Theia originated from the general neighbourhood of the proto-Earth; it has a starting position somewhere between the orbit of Venus and just past the orbit of Mars. They begin their simulations in the late stages of formation of the Solar System (30-50 Myrs after the formation of the Sun) when most planetesimals (small, solid bodies in orbit around a star which will go on to form a planet) are expected to have been accreted onto one of the 5 larger planetary bodies. They therefore do not include any planetesimals in their simulations. They investigate many different possible combinations of orbital parameters for each of the planets and observe which of these simulations result in an impact. They define a “successful” simulation when an impact occurs between 70-110 Myr after formation of the Sun to coincide with carbon dating of rocks on both the Earth and Moon. Figure 3: Semi-major axis (a) against the eccentricity (e) of “successful” simulations producing an impact for the proto-Moon. Points are colour coded by their average AMD value which is an indicator of how much energy is left within the simulation system. The different shaped icons specify which of the author’s simulations was used to produce the orbital parameters. This plot shows the variety of initial conditions that can produce an impact between the pro to-Earth and Theia. The authors find that a significant fraction of the orbital parameters tested produce a “successful” outcome of a collision. The diagram in Figure 2 shows the semi-major axes of the “successful” scenarios where an impact occurs in the pre-defined time window. The authors also consider the Angular Momentum Deficit (AMD) as a success measure of their simulations, which is an indicator of how much energy is left within the simulation system because it measures the system’s deviation from being circular and coplanar; this helps to identify which simulations are dynamically “cold” like the current day Solar System (AMD < 1.5). 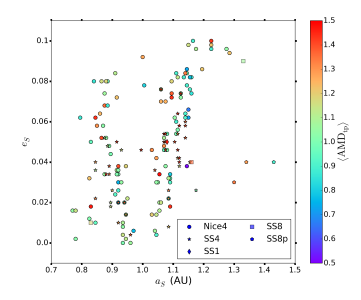 Figure 3 shows the eccentricity (e) and semi-major axis (a) of the proto-Moon colour coded by the mean AMD value of the simulation for all the runs producing a successful impact. This shows the variety of combinations of orbital parameters which can produce the right conditions for a Giant Impact to occur. Perhaps then, such an impact would not have been such a rare occurrence after all. Perhaps Theia was just the unlucky one in our turbulent early Solar System, on a doomed collision course with Earth from the very beginning. Crowd-Sourcing Crater Identification How a Super-Earth Gets Its Atmosphere (or At Least Where It Doesn’t) Why is Mercury so far from the Sun? Why is Mars so small? Hello.The Qur’an(Hadid-25) writes about the union of the world and theia planet (iron).